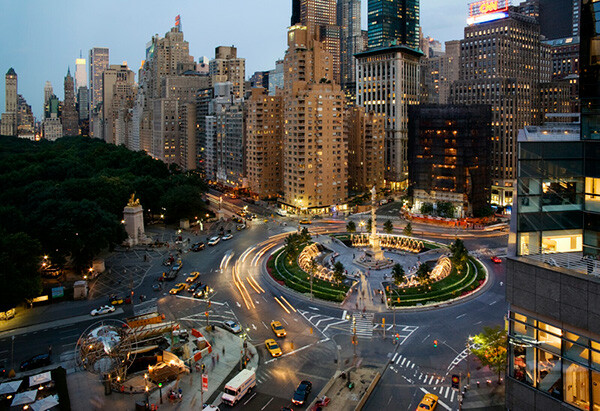 New York, New York 2001-2005 OLIN’s redesign of Columbus Circle returns this historic monument to public access and appreciation, realizing an environment not present for a generation. The design is based on concentric rings of movement and light, to elicit the feeling that the circle is not only the center of the city, but the center of the universe. Today, people stop, meet and relax in the hub of a swirl of traffic, late into the evening. The site’s new fountain is formed by a series of concentric ledges with cascading water and jets arching toward the center, reinforcing the circular design and primacy of the monument. 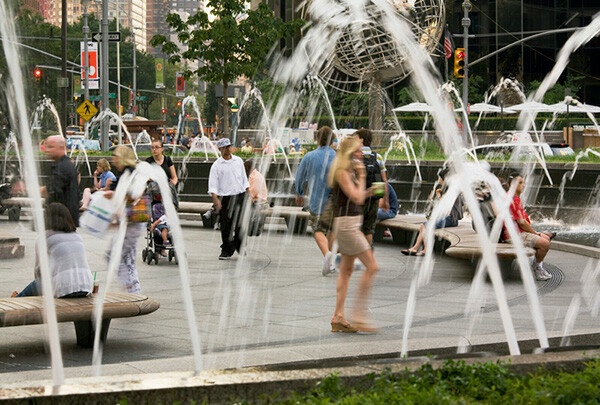 The fountain masks the traffic noise and tempers the summer climate. When turned off, the ledges serve as bleacher seating to avoid the typically forlorn character of unused fountains during winter months. 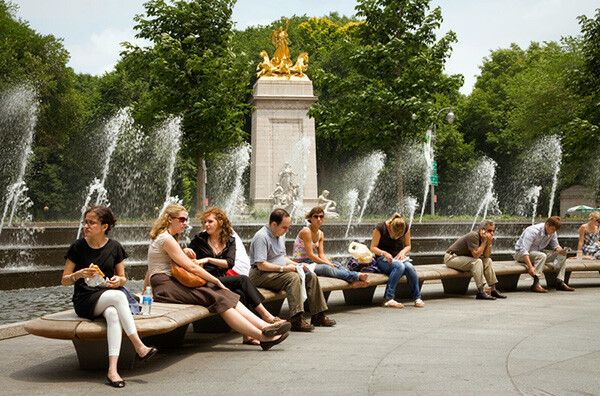 Seating is also accommodated within the plaza. 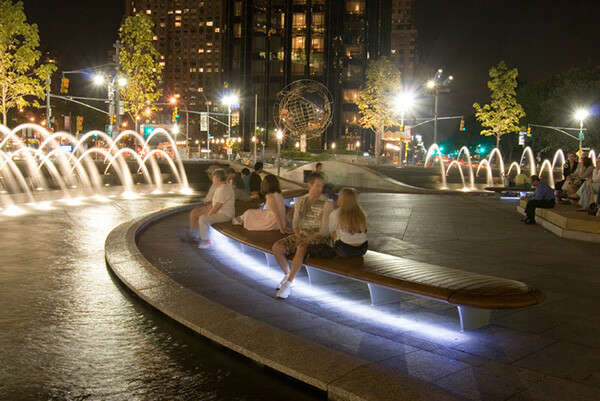 The custom-designed benches are scaled to complement the civic space, and are wide enough to allow individuals to sit comfortably back-to-back. 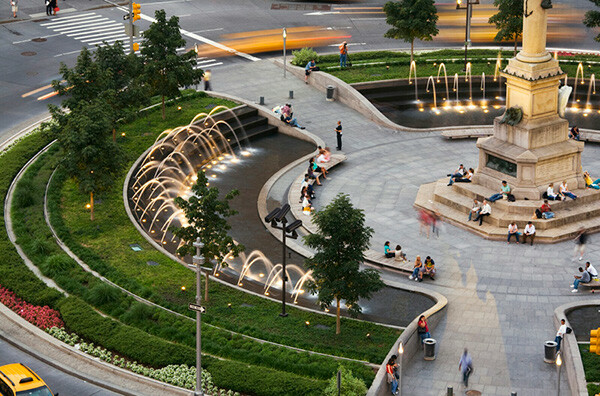 Columbus Circle demonstrates the potential of reclaiming social space in conjunction with rethinking transportation infrastructure. The redesign devotes less area to vehicles, yet traffic flows more efficiently. Disciplining traffic as part of transportation planning, and successfully balancing it with social needs that are competing for a limited amount of space, is a difficult task, but one that is successfully addressed in the redesign and can serve as a model for other cities.